A Tisket, A Tasket. Can You Say Easter Basket? Easter baskets symbolize the celebration of completed Lenten fasting. Although the baskets can in part be traced to pagan roots (traditions that began in agricultural communities) a significant part of their origin lay in the Christian celebration of Christ’s resurrection. Just as the Easter Basket has a global history it has a personal history here at One North Harmon. As a little girl I can remember my grandmother visiting for Easter. Baskets would be in tow. 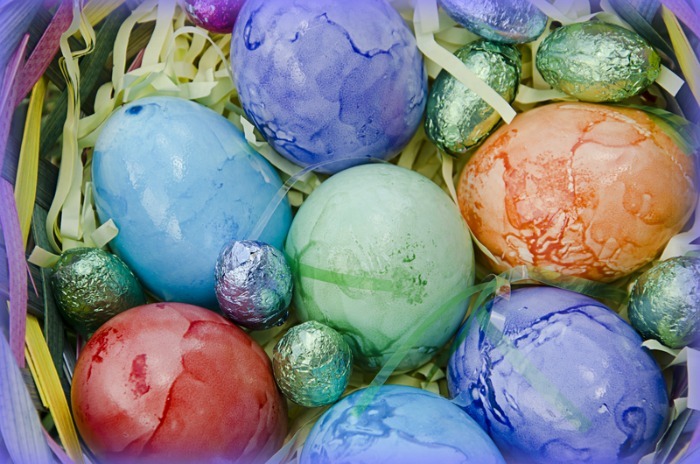 The shiny “grass”, dyed eggs and chocolates were always a favorite part of the day, second only to sitting in Grandma’s lap and feeling special beyond belief. My husband’s sweet Mother and my own Mom continued the tradition of Easter baskets. My Mom was careful to make sure Peeps and malted candies in the shape of Robin’s eggs were present. Doc’s Mom was more practical (with six kids she had to be)! She would include treats but there was always something useful like a pair of socks or gloves. We continue the tradition of baskets. And yes…we still hide them. Our baskets HAVE to have a little candy but we also include something fun like earplugs for an iPod or a tube of lip gloss. Our kiddos are in their teens but they still look forward to the celebratory search! What does your family do for Easter baskets? Do you have a special tradition regarding contents or perhaps you forgo the baskets in favor of a different tradition?